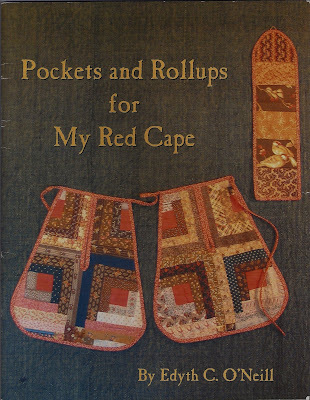 Since we are talking about quilting here on Maida Today, I thought it would be good to mention Edyth O'Neill's book on Pockets and Rollups. Look at the wonderful log cabin quilt pattern that was used to make this colonial pocket. These were worn under garments for close keeping of important items. Rollups were used to store sewing notions. Edyth has more of these books available. The pockets are lovely hung on a wall along with doll quilts. Edyth has copies of this book in limited quantitities. The original soft cover book with full size patterns is available in limited quantities for $15, including priority mailing. Sorry, shipping to Continental USA only. Send a check to Edyth O'Neill, 2155 Lightstone, Fredericksburg TX 78624. 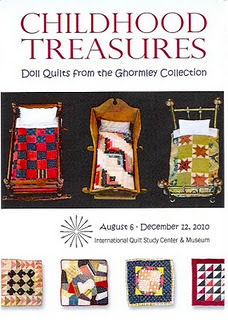 Edyth's blog has more images of doll quilts, so be sure to visit. "I was attracted to the very early doll bed because of it's vase shaped turnings. It looks to be walnut. It is a doll size rope bed. 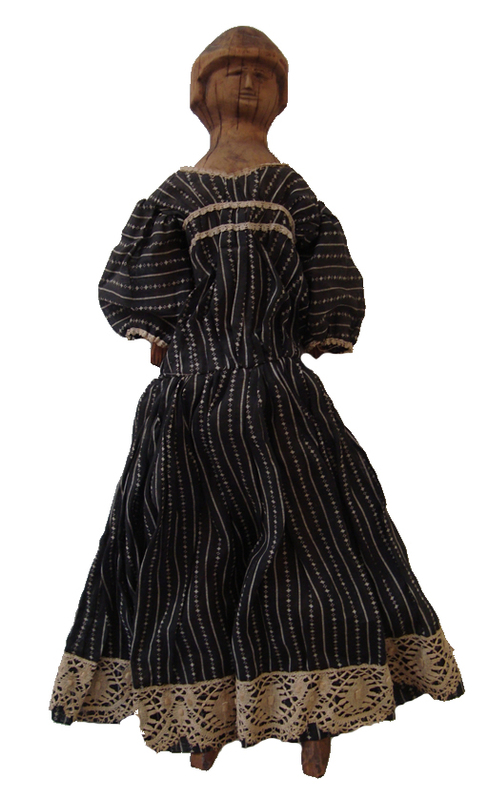 The dolls are German papier mache heads with kid leather bodies and wooden limbs, circa 1845-1855. They are commonly (and in error) referred to as Milliner Models." The quilt is backed with white cloth. Thank you, Tricia, for sharing this lovely old gem! When I asked Tricia what website she would like to refer people to, she recommended Rabbit Goody's site, Thistle Hill Weavers, as one that would be interesting to those who love old textiles. From the book Collecting American Country. After I saw this picture I bought a copy of the book at Amazon. Have you made a doll quilt you'd like to share? Please upload ONE image of a quilt you've made below and enter a link to your blog, website or online picture album. It's fine if your item is for sale, but it doesn't have to be for sale. Click the blue letters that say "click here to enter" and you choose a picture to upload and then have the opportunity to add a link to your site. Please note - If your picture doesn't upload please send it to me via email at northdixie AT gmail.com. I'll load it on. Thanks for sharing, everyone! 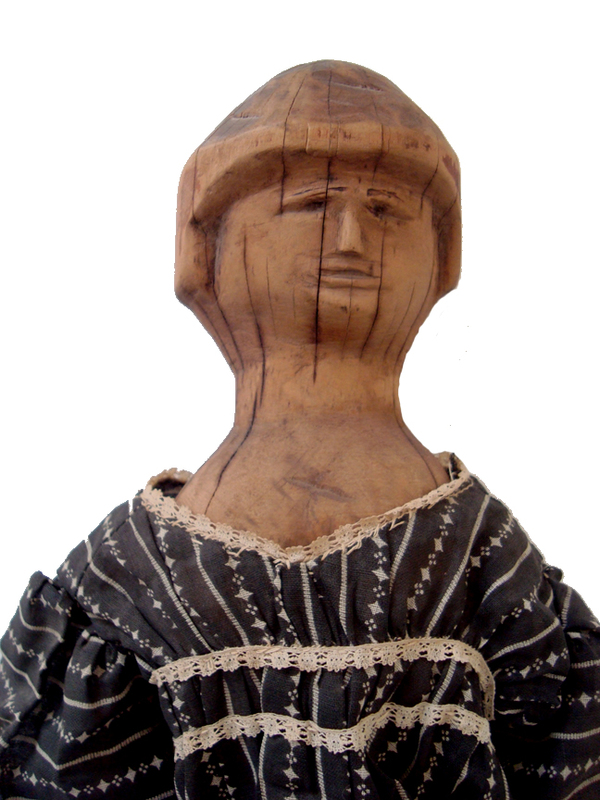 Anonymous Works' Blog is definitely one you should visit if you love folk art. He continually posts such interesting artifacts from history that you will want to be checking daily. I found his site when I was searching for "1840's dolls". 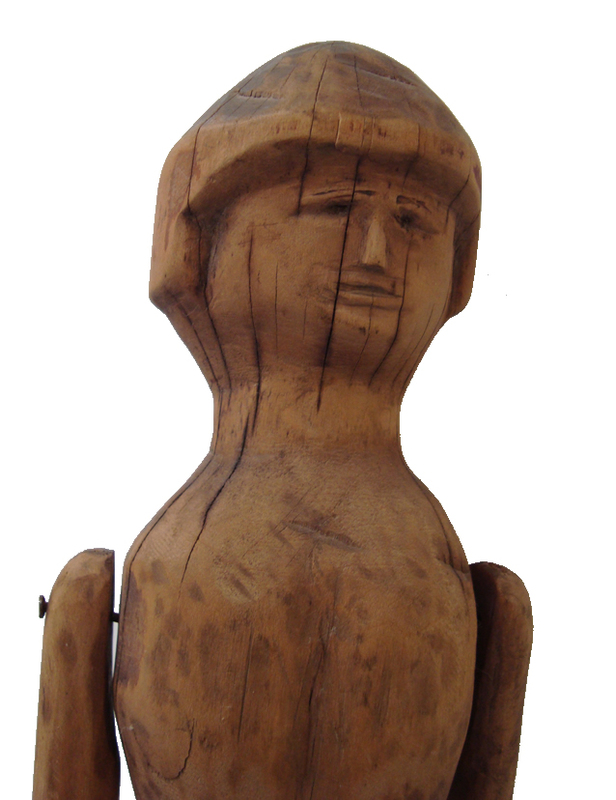 I emailed and asked if I could feature this large 19th century carved wooden doll and he kindly shared images. 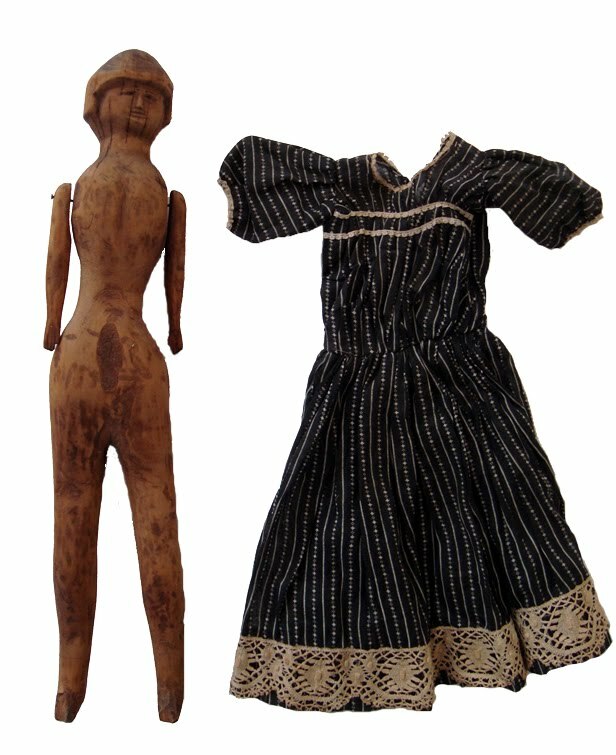 Anonymous Works Website has a lot of wonderful carved folk art pieces as other unique treasures that are interesting to those of inspired by antiques. That's what I would name her if she were mine. She retains so much of her "tree-ness" in her finished state. Who knows who made this doll? A brother for his younger sister, perhaps.